Shāng Yāng (商鞅; Kung-sun Yang; Wei Yang; Pinyin Shang Yang; d. 338 B.C.E.) was an important statesman and social political philosopher whose successful reorganization of the state of Ch'in or Qin, during the Warring States Period of ancient China, paved the way for the eventual unification of the Chinese empire by the Ch'in dynasty (221–206 B.C.E.). With the support of Duke Xiao of Qin, Shang Yang enacted numerous reforms that changed Qin from a peripheral, backwards state into a militarily powerful and strongly centralized state. Shang Yang was a legalist who considered loyalty to the state to be above loyalty to the family. He enacted his reforms by first establishing the authority of law (fa), which was to be enforced impartially, with no regard for social status or position. He stripped nobles of their rank and privileges and organized a meritocracy which assigned rank and privilege to those who rendered service to the state, especially through bravery in battle. Shang Yang's economic theory placed an overwhelming emphasis on the military and agriculture and downgraded "nonessential" activities such as commerce and manufacturing. He introduced land reforms, privatized land, and opened game reserves and wastelands for agriculture. He replaced the feudal hierarchy with a system of centrally chosen governors, and then set out to standardize local administration. Shang Yang is credited with the authorship of the Book of the Lord of Shang ("Shang-Chün shu"), a collection of economic, legal, and political treatises based on his reforms, though it was probably not from his own hand. His philosophical influence stems primarily from the Hanfeizi who credited him with the theory of ding fa (定法; fixing the standards) and yi min (一民; treating the people as one). Shang Yang’s real name was Kung-sun Yang; he was also known as Wei Yang. He was born during the fourth century in Wei, a state in north-central China, to a concubine of the Wei royal family. Shang Yang was a remote descendant of a once powerful family of the early Zhou period in China. According to ancient histories, Shang Yang studied criminal law in his youth and serve as a tutor to the Wei princes. The prime minister of Wei favored him and recommended to the Wei ruler that Shang Yang succeed to the ministry upon his death. This request was denied, and Shang Yang, feeling that he was not appreciated in Wei, journeyed to the western state of Qin (Ch'in), which had been seeking men who could offer practical advice on state affairs. At the Qin (Ch'in) court, he became the confidant of Duke Hsiao, who was just then embarking on a program of military expansion and revitalization of the state. Shang Yang presented him with a proposal for a complete reform of the political, social, and economic structure of the state, advocating strengthening of the judicial system and the imposition of severe punishments for crimes of all kinds. Shang Yang applied his laws so strictly and impartially that even the crown prince was punished on several occasions, once by having his nose sliced off. Shang Yang first established the authority of law and royal decree. The law was to be enforced impartially, with no regard for status or position. Guilt and punishment were to be borne by groups rather than individuals, and the people were required to inform on lawbreakers. Anyone who failed to denounce a criminal was cut in two, whoever denounced a culprit would receive the same reward as one who decapitated an enemy; whoever concealed a culprit would receive the same punishment as one who surrendered to an enemy. The rank of nobility and the privileges attached to it were to be awarded only to those who rendered service to the state, especially through bravery in battle. Membership in the Ch'in royal clan was denied to nobles who achieved no military success, and existing nobility were deprived of their titles and privileges, arousing much antagonism in the court. Shang Yang led a military expedition against his home state of Wei, which he conquered in 350 B.C.E.. He supervised the building of a new capital at Hsien-Yang. In 341 B.C.E., Shang Yang led another expedition against Wei. Shang Yang feigned interest in a peace treaty, met with the commander of the Wei army and captured him. Without their leader, the Wei army quickly lost to the Qin and were forced to cede to them all of the land west of the Yellow River. For his services, Shang Yang was rewarded with a fief of fifteen cities in Shang (modern Shensi), from which his names Lord Shang and Shang Yang are derived. Duke Hsiao died in 338, and was succeeded by King Huiwen, the same crown prince whom Shang Yang had earlier punished by slicing off his nose. Shang Yang was then charged with plotting rebellion and forced to flee. According to one account, he tried to take refuge in an inn but was refused entrance, because the law of Lord Shang prohibited the lodging of fugitives. He tried to return to his home state of Wei, but was sent back to Ch'in. Shang Yang was finally captured while making a stand at his fief in Shang. His body was torn apart by four chariots and his whole family was executed. King Huiwen kept the reforms enacted by Shang Yang. Shang Yang is credited with the authorship of the Book of the Lord of Shang (Shang-Chün shu), a collection of economic, legal, and political treatises, many of which are elaborations of the program he developed in Ch'in. It is doubtful that this book actually comes from his hand, nor is it the work of a single author, but it probably is an outgrowth of his influence. Because of its emphasis on law, this work is considered one of the major ancient Chinese works of the pragmatic and authoritarian Legalist school of Chinese philosophy. His philosophical influence stems primarily from the Hanfeizi crediting him with the theory of ding fa (定法; fixing the standards) and yi min (一民; treating the people as one). Over the centuries there has been much philosophical debate over the content of these notions and, in consequence, the moral significance of Shang Yang. After Duke Xiao of Qin (Duke Hsiao, posthumously Qin Xiaogong), ascended to the Qin throne, Shang Yang left his lowly position in Wei to become his chief adviser in Qin. Qin was a backwards state before Shang Yang's arrival there in 361 B.C.E.. Most of his reforms were adapted from policies instituted elsewhere, but Shang Yang's reforms were more thorough and more extreme than those of other states. Under Shang Yang, Qin quickly caught up with and surpassed the reforms of other states. His changes to the state's legal system (which built upon Li Kui's Book of Law or Fajing, 法經) propelled the Qin to prosperity and built the foundation that enabled Qin to conquer all of China, uniting the country for the first time and ushering in the Qin dynasty. Implementation of Li Kui's Book of Law, with the important addition of a rule providing punishment equal to that of the perpetrator for those who were aware of a crime but failed to inform the government; codification of reforms into enforceable laws. Stripping the nobility of land rights and assigning land to soldiers based upon military success. The army was also separated into twenty military ranks, based upon battlefield success. The promotion of agriculture over commerce to compensate for the shortage of agricultural manpower, and the putting into cultivation of unsettled lands and wastelands. The burning of Confucian books in an effort to curb the philosophy's influence. In 350 B.C.E., Shang Yang introduced his second set of changes which included a new, standardized system of land allocation and taxation reforms. Shang Yang introduced land reforms, privatized land, rewarded farmers who exceeded harvest quotas, enslaved farmers who failed to meet quotas, and gave enslaved citizens as rewards to those who complied with government policies. Shang Yang enacted policies to compensate for the shortage of manpower in Qin. As Qin peasants were recruited into the military, he encouraged active immigration of peasants from other states into Qin as a replacement workforce; this policy simultaneously increased the manpower of Qin and weakened the manpower of Qin's rivals. Shang Yang made laws forcing citizens to marry at a young age and passed tax laws to encourage raising multiple children. He also freed convicts who worked at opening wastelands for agriculture, and opened game and fishing reserves for agricultural development. He emphasized agriculture and the military as the only productive occupations. Shang Yang believed in the rule of law and considered loyalty to the state to be above loyalty to the family. Shang Yang's broad political strategy was to substitute rationalized structures for the organic families and amorphous traditions that characterized Confucian feudalism. He replaced the feudal hierarchy with a system of centrally chosen governors, and then set out to standardize local administration. This was the first step toward a unified system that combined localities into counties, and counties into prefectures, all supervised by a central administration. He enacted a series of measures to reduce the power of dominant families and break them up into nuclear families, by abolishing primogeniture and creating a double tax on households that had more than one son living in the household. The eventual outcome was that Qin became the first area of China in which the nuclear family was more dominant than the Confucian extended family. Shang Yang also moved the capital to reduce the influence of nobles on the administration. He argued that noble rank and privileges should attach only to those who measurably benefited the state. He particularly favored military merit and began to replace clan and extended family structures with military-style "groups of fives and tens." The groups inherited the family's political role and responsibility for controlling each other's behavior, being punished as a group for the misdemeanors of any member.. He also argued against rule by a written code of law on the grounds that ordinary people, once they learned the legal code, would lose their awe of the nobility and no longer respect their rule. "As soon as people know the grounds on which to conduct disputation, they will reject the ritual and make their appeal to the written word." Shang Yang believed that the principle that motivated all human beings was self-interest, and that a legal code was necessary in order to achieve a society that was in the best interests of all, by showing people exactly how they should act. Such a code would replace the arbitrary personal judgments of autocratic rulers who might or might not understand what was best for society. No one was exempted from following the law, regardless of position or social status. Han Fei (ca. 280 B.C.E. – 233 B.C.E. 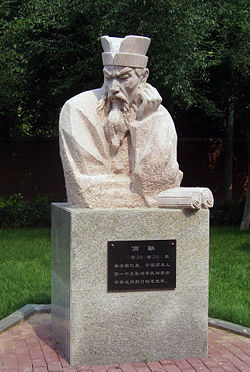 ), China’s greatest legalist philosopher, later synthesized Shang Yang's emphasis on laws, Shen Buhai's emphasis on techniques, and Shen Dao's ideas on authority and legitimacy. He assumed that everyone acted according to the single principle of avoiding punishment while trying to achieve gains, and emphasized the absolute authority of the ruler. Shang Yang had much more confidence in the ability of the people to govern themselves. "The multitude of people all know what to avoid and what to strive for; they will avoid calamity and strive for happiness, and so govern themselves." (Hsiao 1979, 399) Shang Yang’s reforms were characterized by an emphasis on objective, measurable standards rather than intuitive or moral evaluation. An example is his regulation which ties rank and salary increases for the military specifically to the number of enemy heads cut off in battle. Shang Yang sought to limit the power of officials to arbitrarily reward and punish, and to give the people confidence that they were subject to law and not at the mercy of despots. Shang Yang also instituted a system to ensure that ordinary people as well as officials had complete knowledge of the law. "Government officials and people who are desirous of knowing what the standards stipulate shall all address their inquiries to these standards officers, and they shall in all such cases clearly tell them about the standards and mandates about which they wish to inquire. Since the officials well know that the people have knowledge of fa [law] and orders, ... they dare not treat the people contrary to the fa..." Shang Yang’s notion of yimin or "treating the people as one" meant that no one should escape punishment for violating the law, regardless of his rank or position. High officials were subject to the same punishments as commoners. The ruler himself was to be guided by fa (laws) although he issued the edicts, commands and ordinances that are interpreted and implemented by those laws. Some passages suggested that the fa themselves could not be changed by anyone. The appropriate punishment for a particular violation was whatever was necessary to prevent that person from violating the law again, and in many cases that meant death. Lebold Cohen, Joan. '"Shang Yang" ARTnews. 95, no. 4: 118. 1996. Shang, Yang, and J. J. L. Duyvendak. The Book of Lord Shang; A Classic of the Chinese School of Law; Translated from the Chinese with Introduction and Notes. London: A. Probsthain, 1928. Lord Shang – Philosophy Department, Hong Kong University. Comparative Philosophy: Chinese and Western – Stanford Encyclopedia of Philosophy. This page was last modified on 11 September 2015, at 15:13.